The lure of high-end historical fiction—Gore Vidal’s “Narratives of Empire” series, to cite one popular example, or even a movie like “Lincoln”—is the sharing of secrets: The author tells us things we could not otherwise have known, insights and revelations “kept” from us by the limitations of the historical record—the same historical record that provides the story with its plausibility. The key to the success of these narratives is that we viewers and readers want these stories to be true. Our belief is enhanced by the mechanics of imagination. In other words, what is needed is faith, a convergence of belief and fact. This is the key to two films about Jesus currently in circulation: The Young Messiah and Risen. To say they bookend the life of Christ would not be quite accurate. 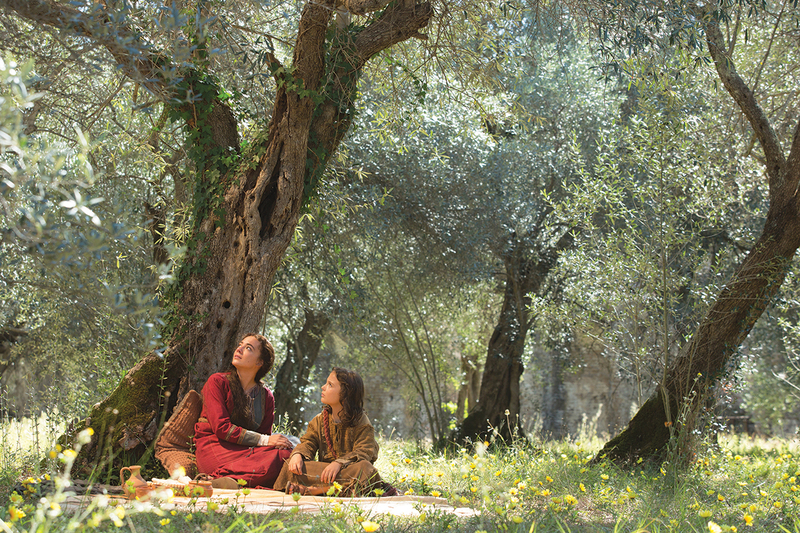 “The Young Messiah”—“inspired by Scripture and rooted in history” as the opening title tells us—imagines the life of the 7-year-old Jesus during and after his return to Judea following the Holy Family’s flight to Egypt. “Risen,” a far more rigorous movie, frankly, is about the risen Christ; the principal narrative begins mid-crucifixion and continues through the ascension. The conceit of “Risen,” which seems certain to provoke, tantalize and perhaps even revitalize a Christian viewer’s belief system, is the resurrection as seen through the eyes not just of a nonbeliever, but of one whose professional duty is to crush the nascent Christian cult of A.D. 33. That man, a Roman tribune named Clavius (Joseph Fiennes), is seen as the film opens walking out of the Judean desert, arriving at an inn and telling the incredulous innkeeper his story—which returns us to the first Good Friday. It is not so good for Clavius. Having just annihilated a band of Jewish rebels, he is immediately assigned the task of keeping Jerusalem quiet for Pontius Pilate (a wonderfully corrupt Peter Firth), the Roman prefect. As Pilate tells his tribune, he has just had to crucify a troublesome Jew named Yeshua (Cliff Curtis), and the followers of this wretched “messiah” will likely be causing him a more troublesome Passover than will the Sanhedrin. In his satirical novel “The Master and Margarita,” Mikhail Bulgakov provides a version of the confrontation between Pilate and Yeshua, one that cannot help but permanently reorder our image of that encounter. Yeshua is made a rather pathetic figure, Pilate a beleaguered civil servant. The entire episode is rendered pedestrian, a matter resolved brutally and quickly, as per the rule of Tiberius Caesar. Each reader will have his or her own reaction to such a gritty, inglorious portrayal, but for this writer the effect was to reorder presumptions, to put flesh on the story, to make it less “myth” and more connected to the human life Jesus led (the description of the characters, after all, is from the mouth of Bulgakov’s Satan character, so the “facts” are already in dispute). Likewise, “Risen,” for all its obviousness, makes the first Easter story something with blood in its veins (and often enough, on the screen: This is not a film for kids). The fleshiness of “Risen” is unmitigated, though at times you wish it were. Crucifixion is portrayed as the cruel, torturous form of execution it was. (“Do the Nazarean a kindness,” Pilate tells Clavius, before dispatching him to Golgotha. “Break his legs.” The effect is to hasten the asphyxiation by which crucifixion killed. Clavius chooses instead to have a centurion stick a spear in Jesus’ side). The post-mortem procedure is almost as gruesome. As done in “Risen,” the executed were thrown into an open pit, doused with lime and left to rot—which makes for some disgusting moments when the powers that be try to fish out and present a public corpse following Jesus’ disappearance from the tomb of Joseph of Arimathea (Antonio Gil). “Risen” is not without humor. While hunting for Jesus’ body and the apostles he thinks made off with it, Clavius asks a roomful of Roman soldiers, “Who knows the woman Mary Magdalene?” Half the men bashfully raise their hands. (The joke is based on the false tradition that Mary Magdalene was a prostitute.) The apostle Bartholomew (a wonderful Stephen Hagan) is dragged in giddy with joy and questioned about the risen Christ. Offering to be crucified himself, Bartholomew is treated to Clavius’s excruciatingly detailed, vivid and condescending description of what crucifixion entailed and how it worked, a sequence that in its own way is far more disturbing than anything Mel Gibson did in “The Passion of the Christ,” because, again, the listener’s imagination is in play. (One recalls the description of hell in A Portrait of the Artist as a Young Man and shudders.) Bartholomew seems visibly shaken, then gleefully offers himself again. It is a very good moment. It is also something of a refreshment after so much of Fiennes’s ponderous performance, although one supposes there is not a lot else he can do with the material. The film, written by the director, Kevin Reynolds, and the fledgling Paul Aiello, provides quite a bit of humor, but little of it is from Fiennes. His character is reminiscent of Richard Burton’s in that old chestnut “The Robe”: the soldier devoted to Rome until his encounter with the Christ and the evidence of his own eyes. He has seen Yeshua on the cross, so he knows him when he walks into a room full of apostles, swarming around their risen Jesus. It is fitting, and no accident, that Clavius sees the Messiah at the same moment that the previously doubting Thomas walks into the room and probes the wounds. Reynolds’s use of Cliff Curtis as Yeshua and Curtis’s own considerable gifts (he’ll be seen soon giving a revelatory performance in “The Dark Horse”) triumph over what has been a problem for filmmakers since the Edison Manufacturing Co. filmed “The Passion Play of Oberammergau” in 1898: How does one portray the divine? Some filmmakers have balked at the very idea, employing mere suggestion, a shielded face, a hand reaching across the frame. Curtis, who imbues Yeshua with a palpable, eloquent kindness, vaults the perceptual impediments that usually accompany the casting of Jesus. One understands instantly why Clavius—the harsh, the violent, the unsentimental—virtually swoons in his presence. Another triumph of casting is the presence of young Adam Greaves-Neal in The Young Messiah. He is a beautiful child, but not cloyingly so. In a role so ripe for second-guessing, he is a joy to watch. The movie is less elevating. The Iranian director Cyrus Nowrasteh, whose “The Stoning of Soraya M.” in 2008 was a triumph for its star Shohreh Aghdashloo, resorts to a great deal of gauzy, focus-free filming in striving for an elevated state of spirituality and a stutter effect intended to provide liveliness in times of visual stasis. It is unnecessary. Much of the music, too, is overwrought (as is the score to “Risen,” come to think of it), along with some of the acting. On the other hand, in cherry-picking Christian apocrypha, the Gnostic gospels and the few lines Luke has given us about the Christ Child—not to mention the Anne Rice novel on which it is allegedly based, Christ the Lord: Out of Egypt—“The Young Messiah” is a film of transcendent moments, if not sustained engagement. One of those moments comes when Jesus, resisting his parents’ wishes that he keep his patrimony and his gifts concealed, cures his ailing uncle Cleopas (Christian McKay) while they are bathing in a river. It is kind of a mashup, visually speaking, and an intriguing aspect of Nowrasteh’s style: The scene suggests baptism, foreshadows the miracles of Jesus’ public career and showcases his mercy. The director does this elsewhere, too. The Demon (Rory Keenan), a.k.a. Satan, who dogs Jesus throughout the film and does all he can to foster fear and loathing among the witnesses to his miracles, kills a running child early on by throwing in his path—what else?—an apple. There is some tweaking even of the narrative as we know it from the Gospels. The hunt for Jesus instigated by Herod the Great, which led to the massacre of the innocents, is perpetuated by his son Herod (Jonathan Bailey), presumably Herod Antipas, though the dates do not seem quite to add up. Neither does Herod’s relationship with the Roman centurion Severus (Sean Bean), who has been given the mission of finding and killing the boy whose birth unleashed so much lethal paranoia seven years before. Herod, a puppet of Rome, treats Severus like a temp worker, though this seems unlikely. What does ring very true is the portrayal of Mary and Joseph (Sara Lazzaro, Vincent Walsh) as nervous, worried, overprotective parents of a divinely inspired child who is being plagued by the devil. Literally. Is there some human, narrative-craving genome that demands stories, plot-driven explanations of our beliefs and our needs and ourselves? It would seem so. We know so little about Jesus the boy that something like “The Young Messiah” addresses a desire we might not even realize we had while filling a very Christian imperative. Jesus, after all, told stories, too. And those stories live on and help us know him better. This article also appeared in print, under the headline "Lives of Christ," in the March 14, 2016 issue. John Anderson is a film critic for Variety and The Wall Street Journal and a regular contributor to the Arts & Leisure section of The New York Times.